We have been discussing the working principles and Air-Standard cycles of different types of Internal combustion Engines in the previous articles. But in this article, we are going to discuss the significance of the Important qualities of the SI engine Fuels. In spark-Ignition Engine, fuels should possess certain qualities to run the engines smoothly and should give the best performance. The Important qualities of Spark-Ignition Engines Fuels are discussed in this section. 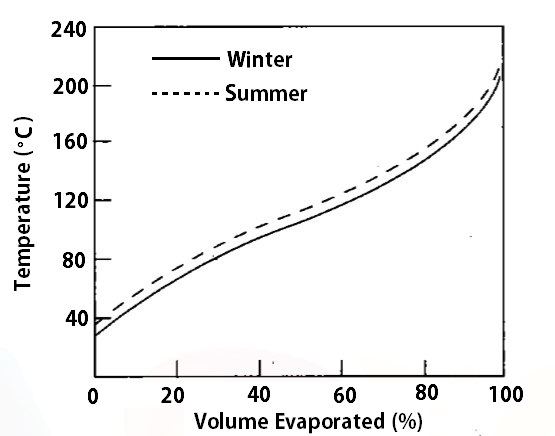 The Volatility of fuel means the tendency of a fuel to vaporize. This is the most important characteristic properties for the spark Ignition engines. Petrol (gasoline) is one of the fuels which is having enough volatility for the spark Ignition Since it is a mixture of different hydrocarbons. We can measure the Volatility of any fuel by the distillation process at the atmospheric pressure and in the presence of its own vapour. The method for measuring this Volatility of the fuel has been standardised by the American Society for Testing Materials (ASTM). The volatility of fuel is necessary at the room temperature also. Because when the engine is at the room temperature, then it is very much necessary for the easy starting of the engine. But as the engine warms up, the temperature of the engine will reach the normal operating condition so it can vapour easily. But when it is at low temperature it is very much helpful for the engine starting. In order to obtain the good vaporization of petrol, low distillation temperatures are preferable in the engine operating range. Better vaporization means the more uniform distribution of the fuel to the cylinder as well as better acceleration characteristics by reducing the amount of liquid droplets in the intake manifold. Liquid fuel remains in the cylinder causes loss of lubrication oil by washes away oil from cylinder walls. Which lead the deteriorates the quality of the lubrication and tend to cause the damage to the engine. And also increase the frictional losses. Along with this, it will also dilute the lubricating oil and weaken the oil film between the rubbing surfaces. So the fuel should vapour before it gets combusted in the cylinder. The high rate of vaporization of petrol can upset the carburettor metering or even stop the fuel flow to the engine by setting up a vapour lock in the fuel passages. This characteristic demands the presence of the relatively high boiling temperature hydrocarbons throughout the distillation range. This requirement should be made for particular distillation temperatures only. Since this requirement is not consistent with the other requirements. The abnormal burning or detonation in an SI engine combustion chamber causes a very high rate of energy release, excessive temperature and pressure inside the cylinder, which affects its thermal efficiency. Therefore the characteristics of the fuel used should be such that it should resist the tendency to produce a detonation. This detonation is called the knocking in the SI engines, this resisting property called the Antiknock property. This antiknock property of the fuel will depend on the self-ignition characteristics of its mixture. It also depends on the chemical composition of the fuel and molecular structure of the fuel. In general, the best SI engine fuel will be that having the highest antiknock property. Since this permits the use of higher compression ratios and thus the engine thermal efficiency and the power output can be greatly increased. Petrol contains hydrocarbons. These have the tendency to oxidize upon storage and for liquid and solid gummy substances. these substances will sticks to valves and piston rings, manifolds. These also clogs in the Carburetor jets also. This characteristic of the fuel will increases with the concentration of the oxygen, with raise temperature and exposed to the sunlight. So in order to get the best performance with petrol, we have to limit the gum content of the fuel and its tendency to form gum during storage. As the sulphur is a corrosive element, so there might be chance corrosion of the fuel lines, Carburetor and the injection system. And also we knew that the sulphur has a low ignition temperature, so the presence of sulphur may reduce the self-ignition temperature, then promoting the knock in Spark-Ignition Engines. So we should prefer the low sulphur content in the fuels. 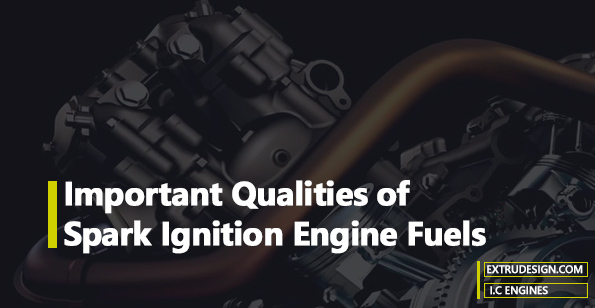 These are the different important qualities for Spark-Ignition Engine fuels. As we discussed the important qualities for Spark-Ignition Engine fuels, such as the Volatility, antiknock characteristics, fewer gum deposits, less sulphur content in the petrol will lead us to the best performance of the spark-Ignition Engine. If you have any thoughts, Please let us know in the comment section below.